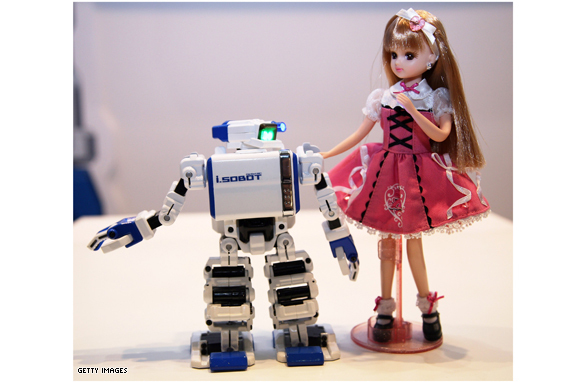 Here is today’s “Beat 360°” pic of the day: The world's smallest humanoid robot displayed last year in Tokyo, Japan. The 16.5 centimeter robot is able to walk, play the drums and keep its balance (Whatever! Our blog can do all those things and more... ). I'm guessing the little lady (pun intended) next to him is to represent scale – but ill let you decide! Update: Check out our winner! "Why do you resist me?" "Don't worry, my batteries are included." "Lets go somewhere just you and me"
"Presidential Candidates of 2075.....is America more ready for a Dolly President, or a Robot? Robot: Look back its says "made in Japan". I can dance for you. Barbie: Oh! me too. I see my back " made in Japan" too. and I agree. Having just arrived from his home planet, i-sobot attempts to make first contact with the first intelligent-looking Earthling he encounters. Barbie: "This is awkward, I asked for an ipod, not an ibot..."
Honey, When you said you were choosen for "Extreme Make-over" ............Well, I never would have imagined! Not tonight baby..I blew a head gasket. Excuse me. Is this the line for lead paint finishing? My iPod walks – does yours? Doll: "Can I Borrow your Batteries?" I like the way YOU'RE built !!! No, our religious differences are not why I am calling it off. In our current economic climate...even Barbie has to deal with "downsizing." You're my date?!?!? Guess internet dating isn't such a good idea! "I dont think we're in Toys R Us anymore toto"
Robot Obama and Hillary Clinton at the convention. Look, no batteries needed Hillary!! "Would you care to dance, care to dance, to dance care ccccare." But Ken, I thought you meant something else when you said, "male enhancement". R2 D what? Stop texting me and talk to me like a man! Hillary: "Maybe if I dolled myself up and get a more logical husband, I think people will vote for me." Oh cool – a robot and a robot doll – maybe they'll travel to Mars and become Martians! "Would you care to dance, care to dance, to dance care ccccare. After G.I. Joe refused to commit, Heidi decided to opt for a custom built boyfriend. "Hey Babe, you're a real doll"
"Oh, Sorry; I don't date guys with anything less than 2 Gigs of RAM"
For the first time in my life I feel proud to be associated with a talking, walking, drum playing robot running for President.